Excavations for the purpose of installing or maintaining plumbing systems can be dangerous. There are numerous risks that need to be taken into account when planning and carrying out excavations. Some of these risks include limited work space, ground instability, oxygen depletion, fire hazards, slippery surfaces, loud noises, airborne contaminants, heat and humidity, and more. It’s therefore important to minimise risks to workers while taking the environment and the characteristics of the excavated material into account. 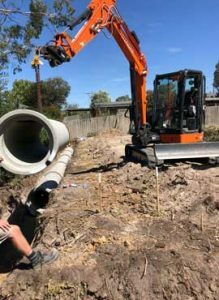 At Lateral Plumbing Solutions, we can provide professional assistance with shaft and shielding excavation in Melbourne in addition to bench excavation. We adhere to strict Australian standards for excavation work and comply with all relevant safety regulations. If you need a simple way of mitigating the risk of ground collapse during excavation, benching can provide a solution. Bench excavation involves creating a series of steps in the vertical wall of an excavation to reduce the height of the wall. This helps improve stability and minimise the risk of soil or rock slipping onto the excavation. However, benching can be impractical in situations where the ground conditions are unstable or the location and depth of an excavation makes the task too difficult. It’s also difficult to bench if space is limited. Fortunately, excavation shoring methods offer a viable ground support system alternative. If you’re looking for a company that can provide shaft, stormwater drainage, shielding and bench excavation, contact Lateral Plumbing Solutions today. We can also provide more information on pipe line construction and what is shielding in excavation.